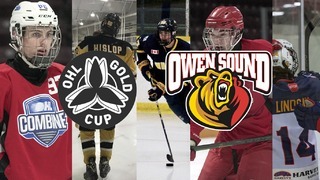 A two-goal performance from Maksim Sushko, including the overtime winner, led the Owen Sound Attack to an upset win in the first game of their series against the Greyhounds at the GFL Memorial Gardens in Sault Ste. Marie. 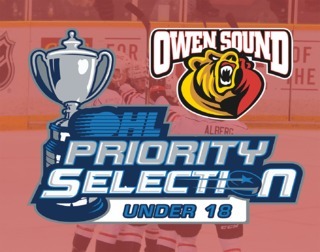 Meeting for the 5th time since 2013 in the OHL Playoffs, the Owen Sound Attack and Sault Ste. Marie Greyhounds were ready for another postseason battle. The Attack come into the series as underdogs to the 3rd seeded Hounds, but hopeful for an upset over the team that ended their run last year. It took less than seven minutes for the first goal to be scored and it was the Attack that struck first. Maksim Sushko fired a rocket on the power play past Matthew Villalta and the Bears had an early lead. The Greyhounds responded shortly after on a power play opportunity of their own, with Keegan Howdeshell continuing his torrid year with his 1st of the playoffs. The Attack has their third power play opportunity late in the period, and Barret Kirwin set up Zach Poirier with a tip-in and Owen Sound headed to the 1st intermission up 2-1. Daylon Groulx did a fantastic job getting under the Hounds skin, drawing three penalties in the period. Shots on goal after the first were 15-12 in favour of the Attack. The Attack opened the scoring once again in the 2nd period, with Kaleb Pearson scoring his first career playoff goal less than a minute into the frame, wiring one into the net at 0:50. Barret Kirwin assisted on the goal, his 3rd of the night. The 3-1 lead wouldn’t make it to the end of the period, Mac Hollowell received a fortuitous bounce to cut the deficit to one, and later in the period Jaromir Pytlik scored to even the game. The two teams would head to the third tied on the shot clock 24 all, and on the scoreboard as well, 3-3. Things slowed down in the third period, as neither team wanted to make any mistakes that could cost them the game. Mack Guzda repeatedly came up big in the Attack net, keeping Owen Sound in the game. The Greyhounds upped the pressure, outshooting the Attack 13-4 but nothing could get by Guzda, and the two teams would head to the first overtime session of the OHL playoffs. Heading into overtime, the Attack seemed to gain a second wind. After spending the latter half of the third period in their own zone fending off the Soo offense, they started to push in the extra period. Villalta and Guzda both shut the door for the first 10 minutes, but the Attack had their chance after Jordan Wale shot the puck over the glass and sat for a delay of game penalty. Sushko finished the game just the way he started it, with a rocket into the Soo net. 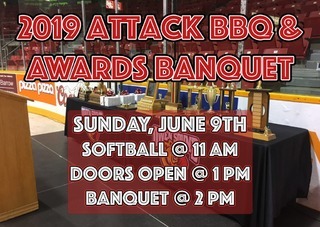 The Attack take game 1 of the series against the Sault Ste. Marie Greyhounds. The Hatten Home Building Centre Hardest Working Player of the Game was Aidan Dudas. The Mac Taylor Corporation Three Stars were Mack Guzda in 1st with 43 saves, Morgan Frost in 2nd with 2 assists, and Barret Kirwin 3rd with 3 assists. 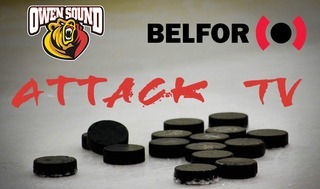 The Owen Sound Attack are back in action Saturday night against the Greyhounds looking to extend their series lead. Puck drop is at 7:07 p.m. Great seats are still available for games 3 & 4 of the series at the Bayshore on Monday, March 25th and Wednesday, March 27th at 7:00 p.m. Tickets are available online and at the MacVicar & McComb Remax Attack Box Office.